"Thorg hungry, Thorg want EAT!" In case you forgot why he’s called ‘Bigfoot,’ here’s a hefty reminder. 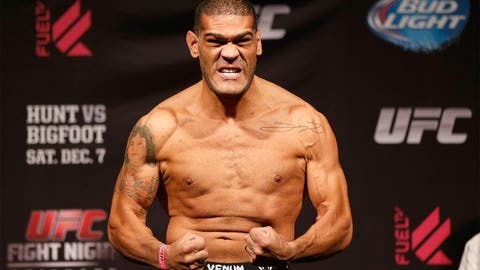 Antonio Silva, who meets Mark Hunt in the UFC Fight Night main event Friday night in Australia, posted a photo on his Instagram earlier in the day of himself on the scale - weighing 282 pounds. Now, of course, the heavyweight maximum in the UFC is 265, so he’s put on 17 pounds since Thursday night. Goodness. That is either one large man or 2 1/2 Demetrious ‘Mighty Mouse’ Johnson’s. And Silva wrote in the caption that he still has three more pounds to go. If his size isn’t frightening enough, take a look at those feet. People have been looking for Bigfoot or Sasquatch of the Yeti - whatever you want to call it - for generations. Well, just watch Fox Sports 1 on Friday night and you’ll see him trying to submit Hunt in Brisbane.